One day in late January, Robert Owens ran a marathon in Antarctica. The next day, after sleeping on the plane, he ran another one in Cape Town, South Africa. Next came successive marathons in Perth, Australia; Dubai; Lisbon, Portugal; Cartagena, Colombia; and finally Miami. The astounding result: seven marathons in seven days on seven continents. Owens is 66. Three years ago, feeling tired and beat up, the lifelong athlete started doing something he’d never done before: lifting weights. When Owens joined Eternity CrossFit in San Juan Capistrano, suddenly he was doing the same rigorous regimen of pullups, pushups, and heavy barbell lifts as the 25-year-olds. And it worked. By normal standards, Owens was pretty fit even before he started CrossFit. 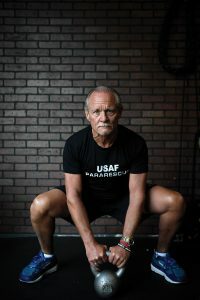 As a 29-year-old Special Ops Pararescueman, he read a 1979 Sports Illustrated story about a crazy new event called the Hawaii Ironman, then did the 1980 race and 11 more over the next decades. All those years, he maintained a regular swimming and running regimen as he raised five kids and worked as a pastor. But despite good aerobic fitness as he entered his 60s, Owens noticed that he couldn’t push the pedals or pull through the water like he used to. “I looked in the mirror and saw my body withering, my muscles shriveling. I could see where I was going and didn’t like it,” he says. Reading that Ironman legend Sister Madonna Buder, a.k.a. 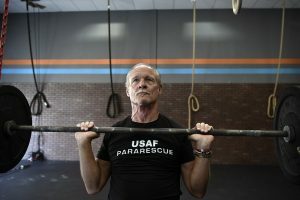 the Iron Nun, resuscitated her career through a strength-training program and set a record as the oldest Ironman finisher at age 82, he immersed himself in the workouts of the day at Eternity CrossFit. Energized by his newfound strength, Owens decided he needed a new challenge, so he embarked on an eight-month round-the-world endurance odyssey beginning last spring. He became the oldest person to complete both The 300 of Sparta, an eight-day, 238-mile run across Greece in May, and the Navy Seals instructors’ sleepless, 50-hour Kokoro Challenge, a hellish water-and-land/strength-endurathon done while carrying a 20-pound backpack. He did an Ironman in October (“No big deal—I didn’t even train for it.”) before gearing up for the 7-7-7 World Marathon Challenge.